Calling two crashes, in 2000 and 2007, Nobel Prize winning economist Robert Shiller warns investors for the next one. He recently gave an interview for the Financial Times in which he stated that the stock market looks like a bubble again. A bold statement anchored on his confidence indices and the CAPE ratio. Professor Shiller likes to focus on the behavioral aspects of the market: investors are human beings and they will act accordingly. The first version of Irrational Exuberance (2000) heavily discussed the high valuations of stocks and irrationality of investors. A few weeks later, the dotcom bubble burst. In the second version (2005), Shiller added a chapter on the housing market. The recently published third version (2015) contains a chapter on the valuation of American government bonds. After calling the market twice, should you take this warning seriously? 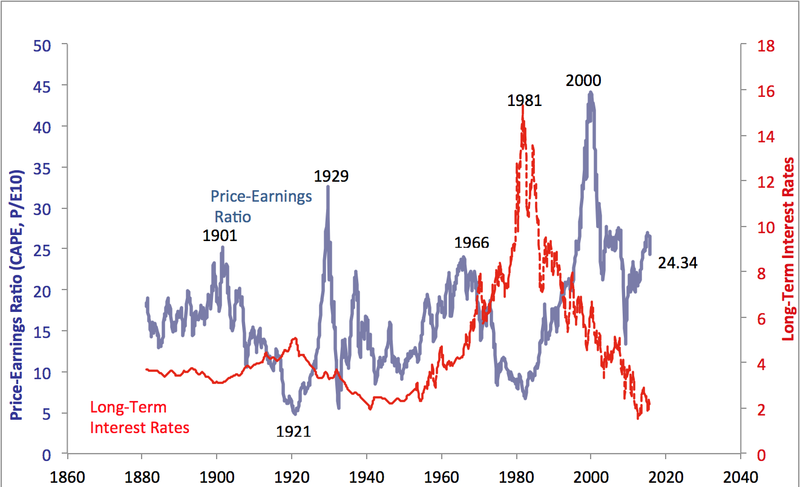 In recent interviews, Shiller has mentioned that he holds a very diversified portfolio, favoring commodities due to their historical low price. He also states that it’s possible the remain within bull market territory. Professor Shiller has been conducting research on the stock market for many years. He operates in the field of behavioral finance, as he thinks the markets are primarily driven by emotions. One of his beliefs is that human beings are wired to act story-driven. In the following paragraph, we will offer a short taste of the consequences. For more information on Shiller’s new book click here. However, the media focusses on what’s different (out of entertainment purposes) and provide the investor with new stories or noise. Talking heads on television will predict things that are almost impossible to predict. Predicting the economy is hard, very hard, so don’t be fooled. The Wall Street Journal examined 700 forecasts by FED officials to find out how well they are at predicting growth, inflation, and the state of the labor market. A good prediction yields +1, a bad one -1. More information on methodology and the full results can be found on this page. The results aren’t encouraging. We must add that current Fed Chair Janet Yellen tops the list, congratulations. Maintain an accurate view of the world. The best returns might not be around the corner. Also, increasing interdependence has forced investors to monitor every major economy. Be consistent, don’t be rigid. Adjust your opinion when facts change, don’t ignore them to match your opinion. Know what you own, it’s the absolutely necessary to gather information. Surely taking a gamble and beating the odds is a more attractive action than taking the loss and admitting a mistake. This story is about YOU. Think about: approximately 15% of the American population directly holds stocks. It’s very likely that these people are risk-takers compared to the 85% not holding an individual stock. Be sure not to be blinded by pride once the market heads downwards. Back to Shiller and his famous ratio. 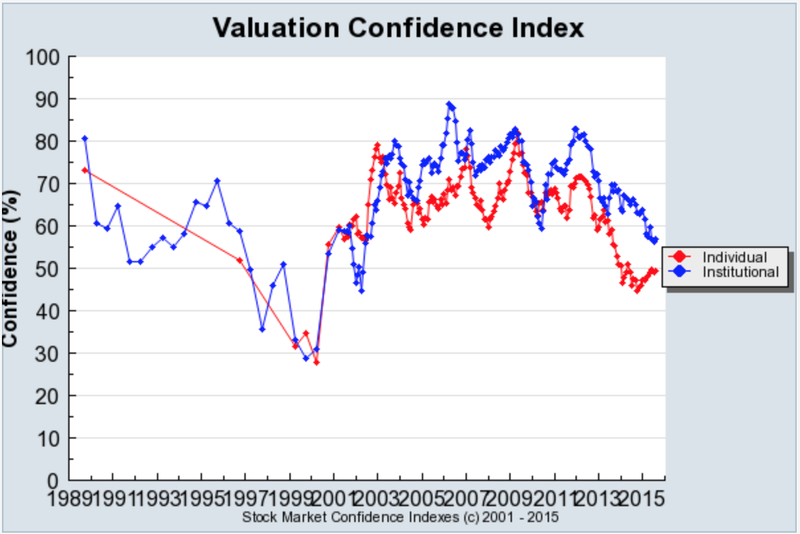 Currently, the CAPE ratio indicates that valuations are rather elevated. Critics have stated several reasons why this shouldn’t worry stock owners. Some say it’s merely an effect of different accounting standards. Others state that price to earnings metrics should be viewed relative to the interest rate level. Low-interest rates push market participants towards more risky assets. If a government bond yields only 2%, why shouldn’t you buy a dividend aristocrat? So how does CAPE differ from the usual P/E ratio? It’s in the name: Cyclically Adjusted Price to Earnings ratio. It’s price divided by the ten year moving average earnings to smoothen out short-lived effects. It also takes into account inflation. There is, however, a lot of discussion about true inflation. More on this will surely follow. So, where are we at? Looking at history, the market does seem pricy (using this metric at least). The CAPE ratio currently sits around 25, 50% above its historical mean of 16,5. It seems like earnings are lagging. As critics state, it’s low interest rates that are moving stock prices upwards. In the September meeting, the FED decided not go for a rate hike. More surprisingly, comments were rather dovish. A rate hike in 2015 is not off the table, however. If we are about to enter a cycle of interest rate hikes, how would this affect the CAPE ratio? To maintain the current value, earnings would have to significantly rise, as the ratio takes into account 9 previous years. Either that, or prices would have to drop. In 1999, when the CAPE ratio rose to nearly 45, it didn’t slow down when it got at 35. In fact, when the entire market is acting irrationally, it can sometimes take a while for the truth to sink in. As far as an indicator, it’s flashing red. Its value for the average investor? Who knows. Shiller recently called the stockmarket overvalued in an interview with FT. The CAPE ratio indicates prices are fairly high. His view, however, depends on more than this metric alone. 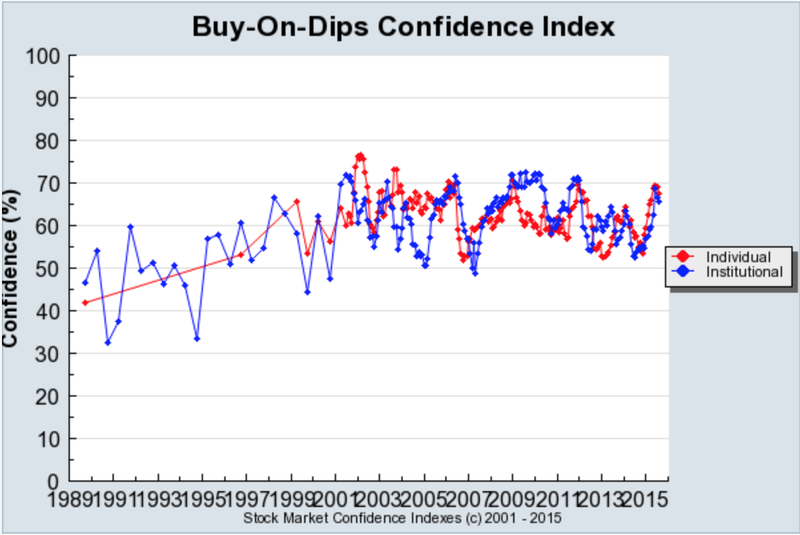 Having developed several confidence indices, he points towards these to support his current pessimistic view on the market. This index measures what investors think about the market in one year. The most obvious trend to spot is that institutional and individual investors have different ideas about the current market. Before the financial crisis, sentiment tended to move in the same direction. In Q4 of 2003, December to be precise, both indices topped above 90%. A similar movement was seen in Q2 of 2006. After the crisis, however, sentiment no longers follow the same path. 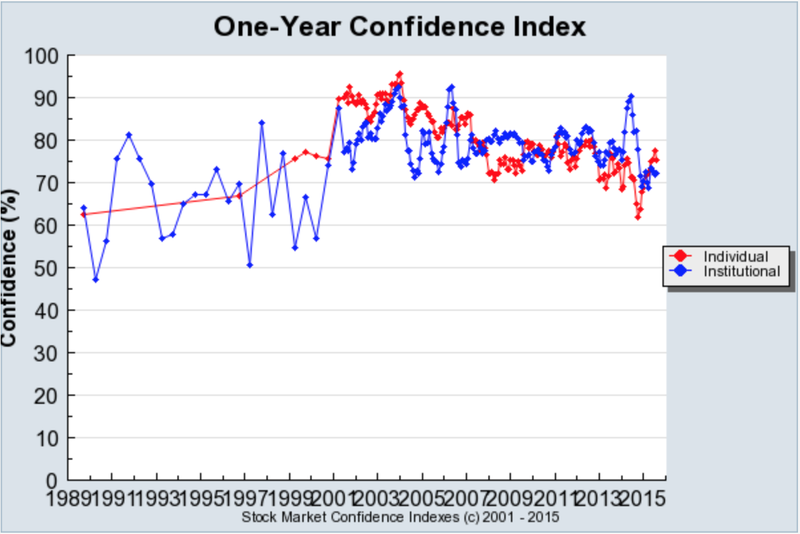 The past 2 years individual investors’ confidence rose, while institutional confidence diminished. Not exactly comforting. Extremely well-camouflaged text most of you will never read. Extremely well-camouflaged text most of you will never read. Extremely well-camouflaged text most of you will never read. This indicator seems to hold up a bit better in two respects. Firstly, both institutional and individual investors seem to move in the same direction. Secondly, the index holds up okay. 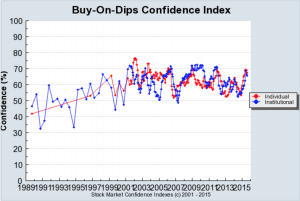 This could indicate that many investors see dips as an opportunity to buy some cheap stocks. They behave like bulls. Perhaps the bull market can continue until investors run out of gun powder. Stock owners keep buying more shares, even when they think they are becoming too expensive. At a certain point in time this will have to end. The catalyst for a turn in sentiment could come from many threats: slower growth in China, tense international relationships, recessions in major economies such as Russia and Brasil,… But the most talked about financial event in recent history is a possible rate hike by the FED. Could this start a ripple effect? 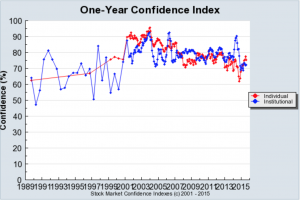 Do we need a fed confidence index? In an effort to combat the major crisis of 2007-2008, central banks started using ‘exotic‘ policy tools. Another reason for the Fed to stand pat on rates is that most other central banks are easing. A tighter Fed at a time of global ease would only exacerbate its effects both domestically as well as internationally.- Irving Kelner quoted in this zerohedge article. Sure, there have been periods with higher interest rates and higher CAPE ratio’s during which the market moved higher. Shiller called the market twice, though. Right now CAPE is rather high, valuation sentiment has been crumbling, and worldwide growth might be stalling. Perhaps prudent investors will start shifting to more defensive assets. Government bonds, for example. Higher interest rates would only fuel this reallocation. Investors might consider other options such as reliable dividend champions. Either way, deteriorating sentiment could induce a flight from risky assets to safer ones. When the FED announced it would not increase interest rates, markets tumbled. 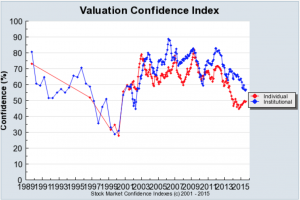 Perhaps it is time for professor Shiller to develop a Fed Confidence index? Watch the Financial Times interview with professor Shiller right here. To summarize: the crowd loves stories. Panic selling, the worst kind, is almost always evoked by a juicy story. But irrationality can be a just as common the other way around: ignoring the facts a ‘juicy story’ provides. When a stock starts to plummet, it is far more attractive to take a gamble and double-down on your own beliefs, than admitting to yourself that you were wrong. Don’t be afraid of the story where you lose money short-term. Additionally, policymakers love stories. Right now the FED is telling us an interesting one: the world economy will recover, just wait a little bit longer. How? Zero interest rates bro! What happens if investors don’t buy that story anymore? Let’s wait and see. Marsellus Wallace has some advice for both individuals and policymakers. The phrasing is spot on.